Baingan Bharta: Baingan bharta or Baingan ka bhurtha is a South Asian dish bearing a resemblance to baba ghanoush. 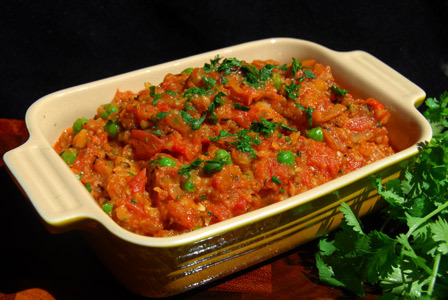 Baingan bharta is a part of the national cuisines of both India and Pakistan. It is primarily a vegetarian dish that comprises bhurtha (minced vegetables) made from eggplant (baingan) which is grilled over charcoal or direct fire, to infuse the dish with a smoky flavour. The smoked eggplant is mashed with fresh cilantro (coriander leaves), chili pepper, onion and mustard oil. Traditionally, the dish is often eaten with an Indian flatbread (specifically roti or paratha) and is also served with rice and/or raita, a yogurt salad. Put the eggplants over red hot charcoal fire or on gas flame to roast. Roast the eggplant on simmer till the skin turns black and the eggplant is cooked through. Remove the black skin of the eggplant, while it is hot. Mash the eggplant or blend it in a mixer/blender. Heat till the smoke comes out of the oil (it removes the raw smell from the oil). Add the finely chopped onions to the oil. Fry the onions till transparent. Add in the red chilli powder, coriander powder, turmeric powder and salt. Add in the mashed egg plant. Allow the mix to simmer for about 5 minutes. Remove the baingan bharta from heat. Garnish it with chopped green chillies and chopped green coriander leaves. Serve hot baingan bharta with chappati.